Most industrial processes do not take place in a climate-controlled laboratory or clean room environment. Real-world industrial activity generates or takes place under harsh conditions that can damage or shorten the life expectancy of equipment, especially electronic sensors. 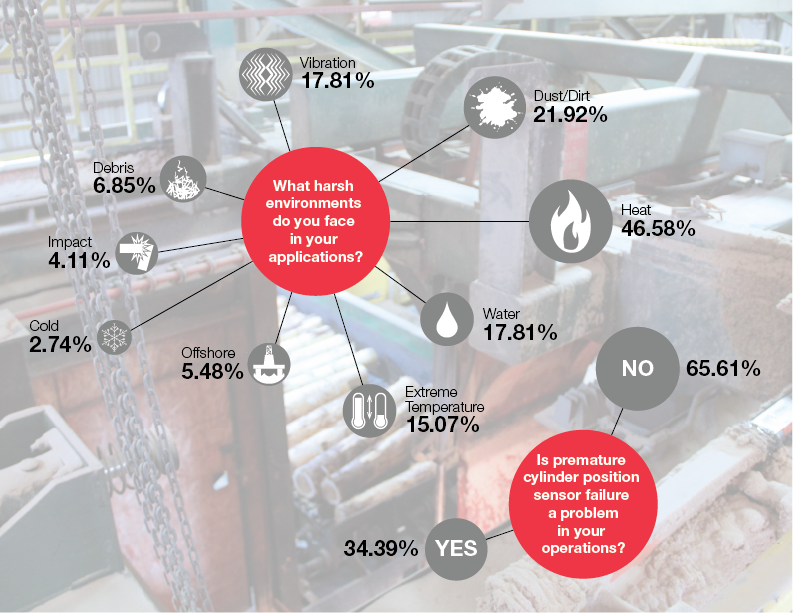 A cross-section of industrial users was surveyed about operating conditions in their facilities. The responses revealed that plant operators are challenged by a variety of difficult environmental factors, the biggest being heat, dust/dirt/water contamination, vibration, and extreme temperature swings. Over one-third of the industrial users surveyed reported that premature sensor failure is a problem in their operations. That is a surprisingly high percentage and something that needs to be addressed to restore lost productivity and maintain long-term competitiveness. Many heavy industries are dependent on automated hydraulic cylinders to move and control large loads precisely. The cylinder position sensors are often subjected to damaging environmental conditions that shorten their life expectancy, leading to premature failure. Fortunately, there are measures that can be taken to reduce or eliminate the occurrence of sensor-related downtime. Help is available in the form of a free white paper from Balluff called “Improving the Reliability of Hydraulic Cylinder Position Sensors”. To learn more about this topic you can also visit www.balluff.us.